Rumor: HTC 11 to feature a borderless display, Snapdragon 835, 8GB RAM and a dual-rear camera ! The Taiwanese company HTC is doing well with its current flagship device HTC 10 that was announced back in April 2016. The company recently started rolling the Android 7 Nougat update to the HTC 10 units and to some other smartphones as well. The company’s next flagship is expected to be called as HTC 11 that will surely have upgraded specifications from the current flagship HTC 10. A user at Chinese weibo has now shared some of the specs of the upcoming HTC flagship. The leaked specifications for the HTC 11 includes a dual rear camera setup, massive amount of RAM and a larger battery than the HTC 10. Let’s check them out in this article. According to the weibo user’s post, The HTC’s upcoming flagship HTC 11 is going to be powered by the recently launched Qualcomm chipset Snapdragon 835 that is built on a 10nm manufacturing process and a more powerful Adreno 540 GPU and this processor is also rumored to power most of the flagships launching next year including the Samsung Galaxy S8, LG G6 and many others. 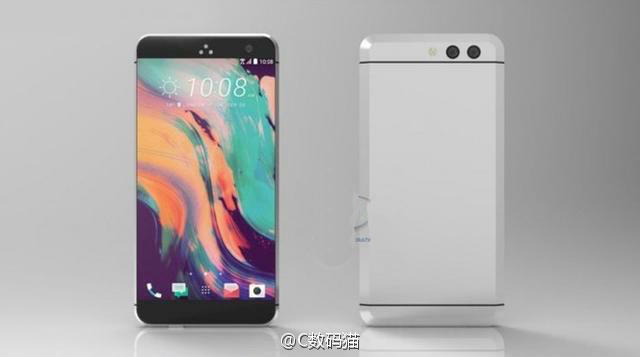 The tipster also says that the HTC 11 will feature a 5.5-inch QHD display with 1440 x 2560 pixels resolution. Further the tipster claims that the HTC 11 will have a whopping 8GB of RAM along with 256GB of internal storage capacity. It will feature a 12-megapixel rear dual camera and an 8-megapixel front facing camera. It is going to be backed up by a 3700 mAh battery supporting Qualcomm Quick Charge 4.0 fast charging feature that Qualcomm claims will decrease charging times by 20% compared to the old Quick Charge 3.0. The image shared by the tipster comes with a borderless display just like the Mi Mix and has a dual-rear camera with an LED flash. A front camera is available on the top right and three triangle dots are also available in the top center of the phone that seems to be the speakerphone. The device will be powered by the Android 7.0 Nougat with HTC Sense 8.0 UI. As for the price, the HTC 11 is expected to be priced around £550+ in the UK. There is no exact information available when the company will launch this new flagship next year. You forgot, according to Mr. HTC himself, it will fly and give the best handy jays west of Taiwan. are these good for commercial use ? Wonderful article.nice information given by you about this gadget. Htc 11 is good but i have faced charge problem.it has some battery problem.